TV thesps share insights about their characters and themselves inside Variety’s Emmy Studio. This award goes to a new fan favorite on the block, whose powerful fanbase exploded into a true behemoth in the past year. 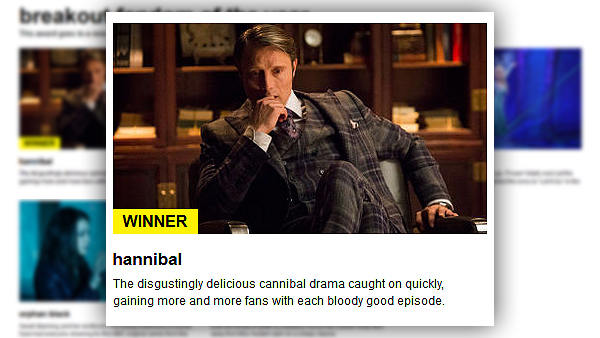 The disgustingly delicious cannibal drama caught on quickly, gaining more and more fans with each bloody good episode. Congratulations to Hugh for being nominated in the category best actor in a drama series for the 2014 Critics Choice Awards. See the entire list of nominees here. Congratulations to Hugh for his nomination in Best Actor in a Television Series and to the cast/crew as well as Gina for the other nominations as well. After a much heated fan-voting battle between FX’s ‘Sons of Anarchy‘ and NBC’s ‘Hannibal‘ during ScreenCrush’s Fan Choice Awards, the horror-drama has emerged victorious in the race for Best TV Drama of 2013. While such acclaimed series as HBO’s ‘Game of Thrones,’ FX’s ‘American Horror Story‘ and AMC’s ‘Breaking Bad‘ all put up a good fight, TV fans voted ‘Hannibal’ Best TV Drama with a massive surge that placed it far ahead of the competition. Based on the acclaimed films and the popular Thomas Harris books, NBC’s ‘Hannibal’ features Hugh Dancy as Will Graham, a troubled criminal profiler who enlists the help of Mads Mikkelsen‘s Dr. Hannibal Lecter to track down some of the most sadistic serial killers. The series will return for a second season on February 28. Thanks to everyone who voted in ScreenCrush’s 2nd Annual Fan Choice Awards! Check out the full list of nominees for Best TV Drama of 2013 below. But Game of Thrones victory was expected, and because of that it was overshadowed by NBC’s HANNIBAL which won total of 6 awards, including Lead Drama Actor and Supporting Drama Actor. The series also did well in the tech field with wins for Sound Editing, Sound Mixing, Picture Editing and Contemporary Production Design. Congratulations Hugh and the entire Hannibal cast and crew! I have added this onto the Awards and Nominations page.